Prime Minister Peter O’Neill will be among the very few watching from New York as the PNG Hunter’s Game and PM’s XIII strive for the best in Brisbane on Sunday and in Port Moresby tomorrow. Mr O’Neill said yesterday that he would have loved to be in Australia or in Port Moresby to watch the PNG Hunters play for victory in the Intrust Cup Grand Final at Suncorp Stadium. But he said that he is attending one of the most important meetings in New York – the UN General Assembly, where all leaders of the world are participating. “I send my wishes also on behalf of the people of PNG and we are proud of both the PNG Hunters and the PM’s XIII teams, as they represent the country’s hopes and aspirations. “All we can ask is for them to do their best. I will be watching the PNG Hunters on TV during my meeting in US. “Sunday marks a most significant achievement for the PNG Hunters, for the players, coach, and officials. 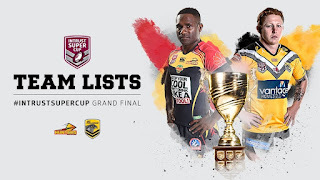 Playing in the Grand Final for the first time, after winning the minor premiership, is a mark of the success the PNG Hunters have achieved in a short period of time in a Queensland state-wide highly competitive competition. “This weekend is a great weekend for rugby league in Papua New Guinea. “On Saturday at the National Sports Stadium, the PNG Prime Minister’s Thirteen will play the Australian Prime Minister’s Thirteen in what has become an annual fixture, with a focus on healthy communities and lifestyles. “History will be made when the national women’s rugby league teams of Papua New Guinea and Australia play in the curtain-raiser to the Prime Ministers match. “We wish both the Prime Minister’s Thirteen and our national women’s team every success on Saturday. On the Sunday game in Brisbane, Mr O’Neill said the coaches, players, officials, and sponsors had achieved great success this season and he was confident that would culminate in the Hunters very first Intrust Cup premiership. “One of the success stories of the PNG Hunters has been the support the team has received from the large PNG community in Queensland, and from rugby league fans in the state generally. “I know that support will be evident on Sunday, as will be the attendance of fans who are travelling from PNG to Brisbane for the game.